The UK parliament prepares for indicative votes later today (Wednesday 27th March, scheduled for the evening) as the 29th March initial Brexit deadline draws closer. Parliament has scheduled 16 (yes, sixteen) options to choose from, increasing very short-term uncertainty. Although the Pound remains hesitant in the short-term, the underlying tone remains solid versus both the US Dollar and Euro. More recently on Tuesday, Prime Minister Theresa May’s Brexit deal received a somewhat unexpected boost as two Eurosceptic members of her own party (Jacob Rees-Mogg and Michael Fabricant) seemed to indicate they may be willing to vote for her deal, with few other options now available. Our focus today on the Pound is reflected by the much-watched Forex rate versus the US Dollar, GBPUSD, commonly referred to in currency markets as Cable. A dip and a rebound from just above our 1.3149 support (from 1.3157) for another probe higher Tuesday (as on Monday) to prod above 1.3247/51 resistances, reinforcing last Friday’s dip and firm bounce from just below our support at 1.3087 (from 1.3079), leaving the bias higher into Wednesday. 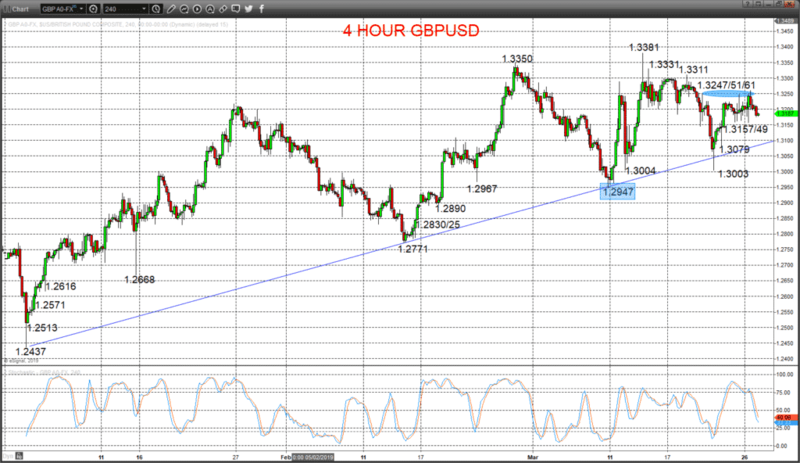 But below 1.3157/49 opens risk to 1.3079, maybe down towards 1.3004/03.